This is a rare benign tumor derived from a portion of the tooth during development. It is much more often found in the lower jaw than the upper jaw. Rarely, they can be malignant or metastatic, but more often found to be benign. However, even though benign, they can grow very aggressively causing significant abnormalities and deformities to the jaws and face. They can even obstruct the nasal or oral airways, requiring surgical intervention. Ameloblastomas are diagnosed by removing a sample of tissue (biopsy) for evaluation by a pathologist under a microscope. A CT scan (“cat scan”) is completed as well as a panoramic radiograph. Once the diagnosis is known, and the CT scans are completed, Dr. Kang will discuss these results with you and the appropriate surgery that will be required. The definitive treatment for ameloblastoma is surgical resection of the tumor with approximately half-inch of normal tissues removed to ensure complete resection of the tumor. Often times, this means that a substantial portion of the lower jaw or upper jaw is removed with the tumor. Once the tumor is removed, using a free fibula flap, Dr. Kang is able to reconstruct the upper or lower jaw returning appropriate form and function to the face and oral cavity. Oral cancer refers to cancer that develops anywhere inside the mouth, in front of the tonsils. They can occur on the lips, gums, tongue, cheek, roof of the mouth, floor of the mouth, and jaws. The most common oral or mouth cancers are squamous cell carcinoma and are treated similarly. 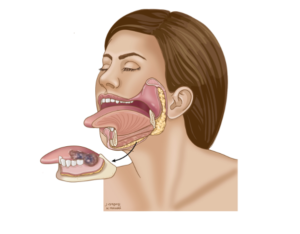 Mandibular tumors or cancers specifically involve the mandible. Symptoms may include a sore that doesn’t heal, a sore that bleeds, a lump under the gums, loose teeth, pain in the tongue, tethering of the tongue, jaw pain, difficulty chewing or swallowing. What causes jaw cancer? Oral cancer occurs when there is a mutation to the DNA of the cells inside of the mouth. We are not sure what causes these mutations, but several risk factors have been identified that may increase the risk of cancer including: tobacco usage, heavy alcohol use, sun exposure to the lips, and human papillomavirus (HPV). The gold standard for treatment of jaw cancer is surgical removal of it. Depending on the amount of bone invasion, a marginal mandibulectomy may be performed. A marginal mandibulectomy removes a rim of bone, leaving the mandible in continuity. This may reduce the need for an extensive reconstruction. Often a soft tissue free flap such as an anterolateral thigh free flap may be required to reconstruct this defect. A segmental mandibulectomy may be required if there is extensive invasion into the bone, requiring a fibula free flap for reconstruction. Often this can be performed without a lip split approach. The goal of reconstruction is to return the patient to a state functionally and aesthetically as close as possible to how they were before surgery, with minimal incisions. Dr. Kang will spend a significant amount of time explaining all of the details regarding surgery. Please write down all of your questions prior to your consultation. Oral cancer refers to cancer that develops anywhere inside the mouth, in front of the tonsils. They can occur on the lips, gums, tongue, cheek, roof of the mouth, floor of the mouth, and jaws. The most common oral or mouth cancers are squamous cell carcinoma and are treated similarly. 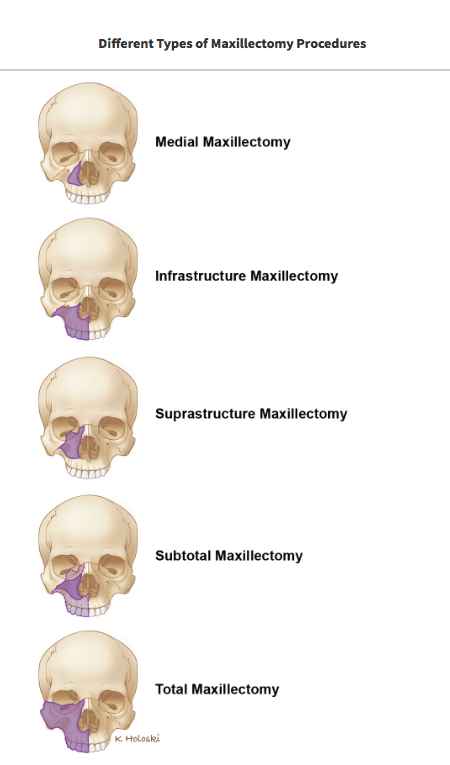 Maxillary tumors or cancers specifically involve the maxilla or upper jaw. What causes upper jaw cancer? Oral cancer occurs when there is a mutation to the DNA of the cells inside of the mouth. We are not sure what causes these mutations, but several risk factors have been identified that may increase the risk of cancer including: tobacco usage, heavy alcohol use, sun exposure to the lips, and human papillomavirus (HPV). The gold standard for treatment of jaw cancer is surgical removal of it. Depending on the amount of bone invasion, a maxillectomy may be required. Depending the on the extent of tumor invasion, a maxillectomy may be removing just a tooth bearing portion of the upper jaw or may include the structures involving the jaw, roof of mouth, and structures involving the sinus, and the orbit. Reconstruction may be completed with an obturator, which is similar to a denture, or may be reconstructed using free tissue transfer or a free flap. A maxillectomy prosthesis or “obturator” restores the surgical defect and aids in the function of speaking, chewing, or swallowing. 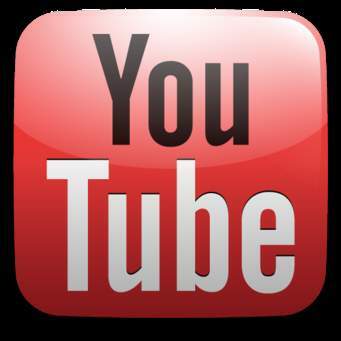 It fills the void left by the surgery and artificially replaces bone and teeth. This is essentially a custom denture with extra bulk to fill the defect created after removal of the cancer. -Surgical: This is the prosthesis that will be placed at the time of surgery and is secured in place by either wires or small screws. It will remain in place until your first post op visit with Dr. Kang. -Transitional: This phase is started 2-3 weeks after surgery when the surgical obturator is removed. The transitional prosthesis is placed and modified until healing is complete. This phase may extend from 3-24 months. Teeth are usually placed on the obturator during this phase. -Definitive: this phase begins when healing is complete and involves fabrication of prosthesis intended for long-term use. Definitive treatment may involve fixed prosthesis (crowns) and/or removable prosthesis. Lymph nodes are glands that are present throughout your body. You may have felt swollen lymph nodes in your neck when you have had an infection such as a simple cold. Their job is to filter the liquid, which naturally leaks out of blood vessels. This liquid (the lymph) travels to the nodes, which contain many white blood cells designed to trap and fight germs, which can cause infection. As well as trapping germs, the lymph nodes can also trap cancer cells. Do I have cancer in my lymph nodes? It is often not possible to tell this until after your operation when the nodes removed from the neck are carefully examined under a microscope. Dr. Kang will feel your neck to see if there are any lumps and you will have a special scan (CT or MRI) to look more closely at the lymph nodes. Lymph nodes can feel big if there is an infection in the area, so if you have a lump in your neck it does not necessarily mean that cancer has spread. If there are only small amounts of cancer cells present in the nodes then the neck can feel normal and look normal on the scan. This is often why we do not know if the cancer has spread to the neck until the lymph nodes have been looked at under a microscope. These results are usually not available until about 1 week after surgery. Yes. There are thousands if lymph nodes throughout your body, which will still be there to fight infection. 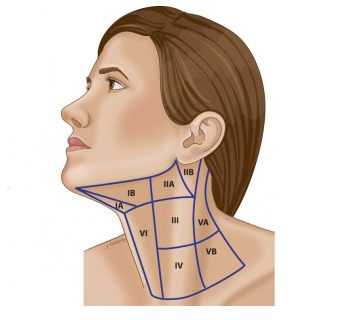 An incision is made to gain access to the lymph nodes in the neck. This incision is usually hidden in an existing skin crease or runs parallel to the creases so that it looks like another wrinkle after healing. The incision extends from below the ear to the middle of the neck under the chin. If lymph nodes are removed from both sides of the neck, then the incision will continue to the other ear. The skin is lifted off the tissues of the neck to expose the lymph nodes. Once the nodes have been removed the flap of skin is replaced with stitches. At the end of the operation, a tube is placed through the skin into the wound to drain any blood, which may collect. This drain usually stays in place for 3-5 days before being removed. Occasionally, the drain will need to remain longer. The skin stitches will be removed 1-2 weeks following the surgery. The skin of your neck will feel numb for several months after surgery as a result of bruising to the nerves. You should be extra careful while shaving since you may cut your skin and not feel it. Using an electric razor may be a good idea to avoid cuts while shaving. •Accessory nerve: this is a nerve which runs from the top to the bottom of the neck and helps you move your shoulder. The nerve has many lymph glands lying very close to it and so it is often bruised during a neck dissection when removing nodes from the nerve. If the nerve is bruised, it can stop working for several months. If this happens, you may experience pain and difficulty in moving your shoulders, which makes getting dressed more difficult. Rarely, the lymph nodes cannot be completely removed without cutting this nerve. Should this be the case then these shoulder problems will be permanent. •Facial nerve: the facial nerve, which makes your lower lip move, can be bruised when lymph nodes close to it are removed. If this happens then lower lip does not move properly and you may end up with lip weakness, which results in a crooked smile. Most of these improve with time but can take several months to resolve fully. Will I need to have further treatment after my neck dissections? This depends on what is found when the lymph nodes are looked at under a microscope. It takes about 1 week to look at the lymph nodes properly, so your doctors will not know until then whether additional treatment is necessary to help cure you of your cancer. Any additional treatment usually involves specialized X-ray treatment in the form of radiotherapy and possibly chemotherapy. Oral cancer refers to cancer that develops anywhere inside the mouth, in front of the tonsils. They can occur on the lips, gums, tongue, cheek, roof of the mouth, floor of the mouth, and jaws. The most common oral or mouth cancers are squamous cell carcinoma and are treated similarly. What causes oral cancer? Oral cancer occurs when there is a mutation to the DNA of the cells inside of the mouth. We are not sure what causes these mutations, but several risk factors have been identified that may increase the risk of cancer including: tobacco usage, heavy alcohol use, sun exposure to the lips, and human papillomavirus (HPV). The gold standard for treatment of oral cancer is surgical removal of it with appropriate reconstruction. Treatment with radiation and chemotherapy often is not recommended as first line treatment for oral cavity cancers. However, depending on the aggressive behavior of the cancer, radiation and chemotherapy may be recommended after surgery and reconstruction. 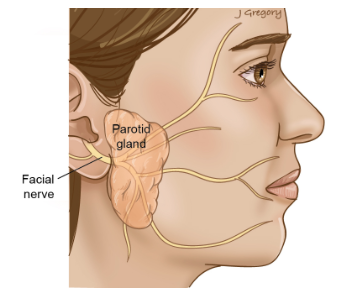 The parotid is a gland that creates saliva. It is located in front of the ear along your jaw bone. Often, a swelling or bump may be noticed. This may or may not be painful. The amount of saliva may be decreased resulting in a dry mouth or possibly pain during eating. What causes parotid tumors? Parotid tumors occurs when there is a mutation to the DNA of the cells inside of the gland. We are not sure what causes these mutations, but several risk factors have been identified that may increase the risk of cancer including: tobacco and heavy alcohol usage. There are usually two options including superficial parotidectomy and total parotidectomy. A superficial parotidectomy often removes 80% of the gland with the tumor. A total parotidectomy requires removal of the entire parotid gland. Regardless of superficial versus total parotidectomy, all of the facial nerve branches are identified and meticulous dissection is performed to protect and retract the nerves during surgery. General anesthesia will be used. Dr. Kang will identify a natural skin crease in front of your ear and along a natural crease in the back of the neck to hide the incision. Once the tumor is removed, and drain may be placed. You may go home the same day or stay a few days in the hospital depending on the extent of surgery. Dr. Kang will spend time with you discussing the nature of the surgery and ensuring all of your questions are answered. Skin cancers often develop in areas of sun-exposed skin including the scalp, face, lips, ears, neck, and extremities. Skin cancer affects people of all skin tones, including those with darer complexions. Skin cancers begin in the top layer of the skin, the epidermis. Much of the damage to the DNA that causes cancers are from ultraviolet (UV) radiation found in sunlight, and tanning beds. Other factors may contribute to skin cancers including exposure to carcinogenic toxic substances. Often your dermatologist or Mohs surgeon will remove the skin cancer and close the wound, however, if the wound is large and requires more complex reconstruction in the operating room, Dr. Kang may be consulted for reconstruction. In other cases, if the skin cancer is too large for removal in the office, you may be referred to Dr. Kang for excision in the operating room. A sentinel node biopsy may be performed at the same time as excision or reconstruction to check if there is any spread to adjacent lymph nodes. General anesthesia will be used. Dr. Kang will remove the tumor or reconstruct the Mohs defect using like tissues, but if the defect is significant he may require transplanting tissue from another part of your body. You may go home the same day or stay a few days in the hospital depending on the extent of surgery. Dr. Kang will spend time with you discussing the nature of the surgery and ensuring all of your questions are answered. The submandibular gland is a gland that creates saliva. It is located under your jaw bone, along the inferior border of your jaw bone. Often, a swelling or bump may be noticed. This may or may not be painful. The amount of saliva may be decreased resulting in a dry mouth or possibly pain during eating. What causes submandibular gland tumors? Submandibular gland tumors occurs when there is a mutation to the DNA of the cells inside of the gland. We are not sure what causes these mutations, but several risk factors have been identified that may increase the risk of cancer including: tobacco and heavy alcohol usage. In addition, the submandibular gland often is removed for salivary stones, and are treated in a similar fashion. A small incision is made in the neck, often in a natural skin crease to hide the incision. The gland is often removed without difficulty. General anesthesia will be used. Dr. Kang will identify a natural skin crease in your neck, in order to hide the incision. Once the gland is removed, and drain may be placed. You may go home the same day or stay a few days in the hospital depending on the extent of surgery. Dr. Kang will spend time with you discussing the nature of the surgery and ensuring all of your questions are answered. 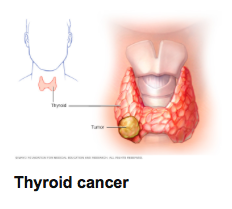 Thyroid cancers or tumors often do not cause any signs or symptoms early in the disease, however, as the thyroid cancer grows, it may cause a lump, changes to your voice including hoarseness, difficulty swallowing, pain in your neck and throat, or swollen lymph nodes in the neck. It is unclear what causes thyroid cancer, however, when the DNA undergoes genetic changes or mutations, they could turn into cancer. Some risk factors include exposure to high levels of radiation, or inherited genetic syndromes. Thyroid cancer occurs more often in women than in men. Treatment of thyroid cancer may involve multiple modalities. The team involved may include Dr. Kang, an endocrinologist, radiation oncologist, and a medical oncologist. The treatment options may include surgery, radioactive iodine treatment, thyroid hormone therapy, external beam radiation therapy, chemotherapy, or targeted therapy. General anesthesia will be used. Dr. Kang will identify a skin crease in the front of your neck to hide the incision. Depending on the size of the tumor, he likely will make a small 4cm incision that will be inconspicuous. You may go home the same day or stay a few days in the hospital depending on the extent of surgery. Dr. Kang will spend time with you discussing the nature of the surgery and ensuring all of your questions are answered. Head and neck cancers, especially in the tonsil and base of tongue region have been very difficult to manage because of their location. Traditionally, these cancers have been accessed using large incisions and cutting of the lower jaw. Recently, Transoral Robotic Surgery (TORS) has been used to access these difficult tumors. TORS is the name given to using the assistance of a surgical robot to remove tumors from the throat or mouth. This is a minimally invasive procedure where the arms of the robot are strategically placed inside the mouth of the patient to see and reach the tumor. Dr. Kang sits in a console near the patient, to access the tumor through the mouth, into areas that his hands probably could not reach. TORS is potentially a good option because it may reduce the need for additional therapy, and patients who elect to undergo TORS may find that they require a lower dose of radiation. If you have any questions regarding TORS surgery, please do not hesitate to contact and discuss this procedure with Dr. Kang.